Kaikoura’s Levi O’Conner returns to Christchurch this weekend to defend his title in the Exit Surf Men’s Canterbury Surfing Championships. The 30-year-old surfer competes selectively, and predominantly in the South Island, although has ventured north to compete once this year. With his smooth style groomed on the right-handers of Kaikoura’s Mangamaunu, O’Conner often sticks to home-based events but in 2018 blew away the field at the Canterbury Champs. This weekend he returns for a title defence where he will take on four of the top ten ranked surfers in New Zealand at the final South Island based event as the national season draws to a close. Surfers will vie for significant ranking points before the final event being held at Raglan the following weekend. O’Conner will also face off against the four finalists from the most recent South Island Championships held over Easter. Dunedin’s Elliott Brown finished third last weekend and was runner up to O’Conner in 2018. Brown is slowly finding form this year and his explosive style of surfing can match that of O’Conner when it all clicks for the teenager. Amongst the North Island surfers making the trip south for the event are four that will want to push for the win. Number three ranked Levi Stewart (Waihi Bch), Caleb Cutmore (Rag) and Jack Lee (Whakatane) will all be looking for a podium finish as will tenth ranked Maz Quinn (Gis) who makes an appearance this weekend at an event he last won in 2016. The Exit Surf Canterbury Champs also includes age group divisions with a small but talent laden field of surfers ready to surf off against one another. The aforementioned Cutmore and Lee will lead the way in the Under 18 Boys Division. 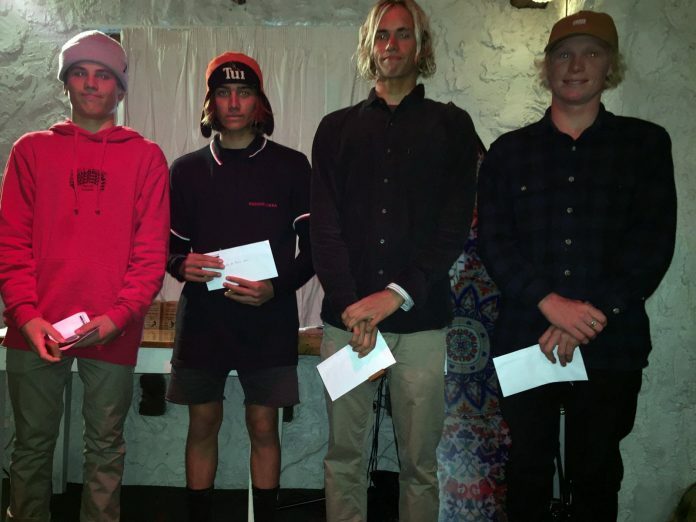 Finn Vette (Gis) and Jayden Willoughby (Rag) will contest the Under 16 Boys Division as the top two seeds but will be weary of another Kaikoura surfer in Reuben Lyons who won the most recent event in Dunedin. The two Christchurch Jack’s in McKenzie and Tyro lead the all South Island field in the Under 14 Boys Division. Zen Wallis (Piha) and Hugh Ritchie (Chch) will do battle again in the Men’s Longboard Division, the two top seeds having been going head-to-head all year. Wallis got the nod in 2018 but Ritchie got the nod at last weekend’s Dunedin event for his first win of the season. The dual sanctioned event with the South Island Surfing Association has the Over 30s and Over 45s Division which features South Island’s top senior talent. The three-day event takes place from Friday through until Sunday (26 – 28 April) along the Christchurch coastline from Taylors Mistake to Gore Bay. Participants across the eight divisions will be vying for $10,000 in cash and prizes. Action will take place from 8am each day and finals are scheduled for Sunday afternoon. Please see below for the current New Zealand Surf Series and Grom Series rankings after the most recent event – the Emerson’s South Island Championships held at Dunedin during Easter Weekend. For more information on the Exit Surf Men’s Canterbury Championships please contact Ben Kennings on 021 2278732 or email benkennings@surfingnz.co.nz. Alternatively contact Russell Ritchie on 0274325972 – russell.ritchie@xtra.co.nz. The Exit Surf Men’s Canterbury Surfing Championships would not be possible without the support of Exit Surf, Make, Eruption Brewery, Pier Lodge, Dave’s Carpet Installations, Robertson and McKenzie families, host club North Wai Boardriders and the South Island Surfing Association. High resolution images will be available to media upon request. Images will be distributed free of charge. Keep in touch with all the surfing info from around the country by following Surfing New Zealand on social media – @surfingnz across Facebook, Instagram, Twitter and Snapchat. Follow the action via the event Facebook Page. Piha surfer Zen Wallis defended his title at the Emerson’s South Island Championships today (Sunday 21st April), his best result of the year and second career win on the New Zealand Surf Series. Wallis was joined by 17-year-old Christchurch surfer Estella Hungerford who took out her first ever win in the Open Women’s Division. The weather turned for the worst on the final day with a southerly front marching up the Otago coastline producing onshore winds but with it, the biggest waves of the three-day event which were in the 1.0m – 1.5m range at St Clair Beach, Dunedin. Wallis was challenged by two of his younger opponents in the final but finally trumped them with a 14.43 point heat total. “I have had a lot of close heats this season and I figured my luck was ready to turn soon” said Wallis who was happy with the way he put together his finals performance. “To come down here and defend my title is special, it was the first time I won a national event last year which was a proud moment for me, but to make it two in a row is even better” he added. It is the first time Wallis has made it past the quarterfinals this year and the result has pushed him up nine places to sixth overall on the New Zealand Surf Series. Another Piha surfer in Shane Kraus finished runner up in the final, the 19-year-old surfing to a 13.7 point heat total to edge past local hope Elliott Brown who finished on 12.2 points. Dunedin’s Josh Thickpenny finished in fourth place overall, unable to reenact his feats in the Over 30 Men’s Division which he won earlier in the day. Hungerford posted an 11.6 point total in the Open Women’s Division final for a comfortable win over an all-South Island cast of surfers. “In 18s it didn’t go my way earlier in the day, I had one good ride in that final but couldn’t find a backup and lost” said the teenager. “I wanted to win the 18s more but had a bad heat so that fired me up for the Open Women’s” she added of her motivation to win the South Island Champs after making the final on previous occasions but always coming up short of the win. “I surfed a good heat which I was most happy about. The sets were inconsistent but I waited for them and got a couple” said the quietly spoken goofy footer. Dunedin surfer Tash Civil finished runner-up in the final ahead of Shani Ayson (Dun) and Anna Hawes (WC) who finished third and fourth respectively. Wallis was again in action in the Men’s Longboard Division but this time could not produce a winning performance finishing second to the defending champion Hugh Ritchie (Chch). Ritchie finished with an 11.6 point heat total, less than a point clear of Wallis with Stephen Lee (WC) finishing in third and Nick Black (Chch) in fourth. Elliott Brown produced his winning performance in the Under 20 Boys Division making up for the Open Men’s Final while Taranaki surfer Tom Butland won the Under 18’s, Kaikoura’s Reuben Lyons the Under 16s, and Tao Mouldey (Mnt) getting the double in the Under 14s and 12s. Double finalist Shani Ayson (Dun) won the Under 20 Girls Division with Georgia Wederell (Mnt) winning the Under 18s, Liv Hayson (Piha) the Under 16s, Misha Peyroux the Under 14s and Chloe Groube the Under 12s. Almost 200 entries were received for the three day event with the vast majority coming from the South Island surfing community eager to contest the southern-most nationally sanctioned event. The three day event was hosted by South Coast Boardriders and was dual sanctioned by Surfing New Zealand and the South Island Surfing Association. The event featured 17 divisions ranging from Open Men and Women through to Under 12 Boys and Girls, Longboard, Seniors and Stand Up Paddleboard. The event is also part of the New Zealand Grom Series and the New Zealand Longboard Series. Please see below for results from the Emerson’s South Island Championships completed at St Clair Beach Dunedin today (Sunday 21st April 2019). For more information on the Emerson’s South Island Surfing Championships please contact Ben Kennings on 021 2278732 or email benkennings@surfingnz.co.nz. Keep in touch with all the surfing info from around the country by following Surfing New Zealand’s social media channels – @surfingnz. Dunedin is the focus of the New Zealand Surf Series this weekend with the Emerson’s South Island Championships taking place at St Clair Beach starting Friday (19 April). The Easter event has a proud tradition of taking on whatever conditions the full moon offers over the holiday period and this time around the weather looks settled to start the event with a small swell. Almost 200 entries have been received for the three-day event with the vast majority coming from the South Island surfing community eager to contest the southern-most nationally sanctioned event. Defending champion Zen Wallis (Piha) returns to Dunedin this weekend as one of the top seeds along with fellow Piha surfer and number two seed Shane Kraus. Wallis heads into the event looking to find form after a string of early exits this year which has him ranked 15th overall. There are a number of past event champions entered in the event including 2017 and 2016 winners Luke Murphy and JC Susan, both locals that excel in the Dunedin line up. The two surfers are more than capable of winning another title as are the likes of Elliott Brown and Jack McLeod, two young Dunedin surfers that spend more time in the St Clair waves than most. Add to the Open Men’s Division mix Christchurch surfers such as Conor Mclennan and Harrison Whiteside, and the sharp end of the Emerson’s South Island Championships will be stacked with talent. The Open Women’s Division comprises a number of up and coming junior talent including Mount Maunganui surfer Georgia Wederell, Estella Hungerford (Chch) and Tegen Bishop (Chch) who fill the top three seeds. Bishop is the defending champion at the event after a close win in 2018 and will be searching for some good season-ending form. Bishop, Wederell, and Hungerford will be three of a number of juniors that will be on double duty as they contest the Under 18 Girls Division as well. The age group divisions form part of the New Zealand Grom Series and the event is the third in a row for the South Island after the Duke Festival in Christchurch and the Kaikoura Grom Comp that took place two weeks ago. 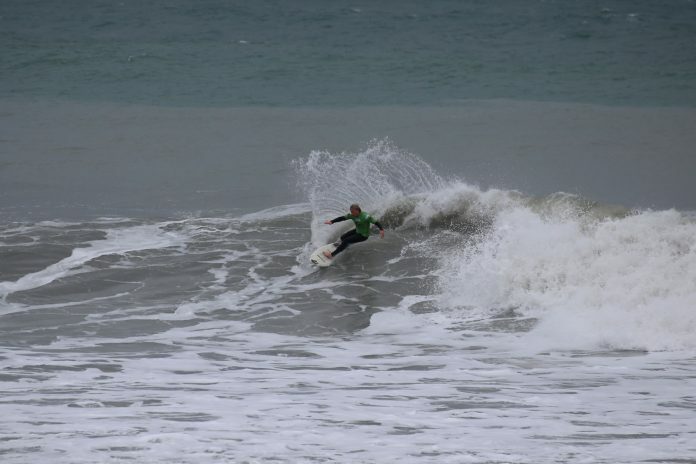 The junior Dunedin surfers will be keen to compete at home with the likes of Luke Rogers and the Peyroux siblings, Ruben and Misha, having shown good form all season. Hugh Ritchie (Chch) returns to defend his title in the Longboard Division where he will be up against a predominantly South Island line up plus 2018 runner-up Zen Wallis. As a dual sanctioned event, the additional divisions of Over 30s, 45s, SUP and Senior Women’s will all go toward the South Island Circuit rankings. The surf is expected to remain in the 1.0m range with light variable winds forecast for the first two days with a developing southerly for the finals on Sunday. All forecasts point toward the event being held at St Clair Beach although the official call will be made at 7am on Friday morning, day one of the event. The three-day event is hosted by South Coast Boardriders and is dual sanctioned by Surfing New Zealand and the South Island Surfing Association. The event features 17 divisions ranging from Open Men and Women through to Under 12 Boys and Girls, Longboard, Seniors and Stand Up Paddleboard. The full draw can be accessed here – Emerson’s South Island Championships. South Island Circuit Rankings – Click here. Please see below for winners of the Emerson’s South Island Championships over the past five years. 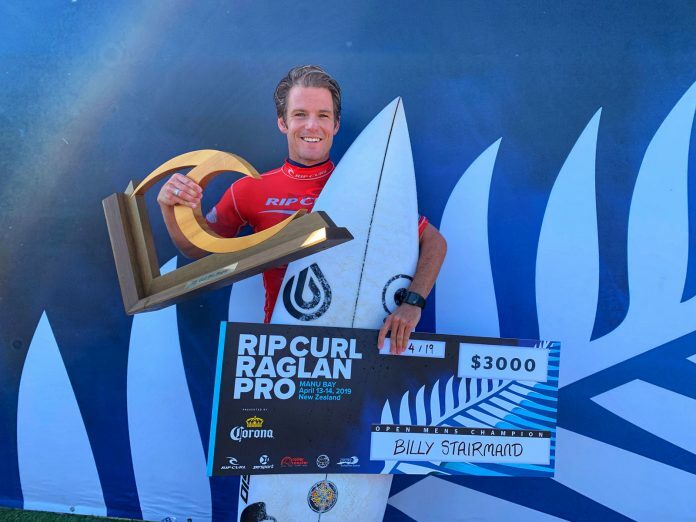 It was a three-4peat for Raglan’s Billy Stairmand today (Sunday 14th April) after blowing away a strong field of domestic surfers at the Rip Curl Pro presented by Corona held at Manu Bay, Raglan. Stairmand was joined by Mount Maunganui surfer Raiha Ensor who claimed the Open Women’s Division. Both surfers now lead the New Zealand Surf Series rankings after three of seven events this year. Stairmand looked unstoppable all weekend and his relentless performances continued into the final as he went on to post a 16.44 point heat total out of a possible 20 points, easily defeating fellow local Luke Cederman in the same one-two scenario as the 2018 event. “Yeah, I mean I keep saying it but my equipment is so good at the moment and it just makes me comfortable when competing” exclaimed Stairmand. “I wanted to put on a show out there because there are heaps of people watching today and also live on Sky Sport” he added. Stairmand held half of the top ten single-wave scores of the weekend showing his dominance but he was also quick to mention his strategic approach to his heats. Stairmand now eyes up two international events in Indonesia and Australia as he hunts down more World Surf League qualification points. Cederman finished runner up on 13.93 points, unable to match the speed and flow of Stairmand who is the best part of 25kg lighter than the big goofy footer. However, Cederman managed to show glimpses of his brilliance and did enough to hold off Daniel Farr (Tara) who finished third in the final, one place better than 2018 and the third local surfer in the final, Luke Hughes who finished fourth. The Open Women’s Final was a much closer affair with Ensor getting the nod over Gisborne’s Saffi Vette 13.9 vs 13.47, the win coming down to a fall from Vette as she pushed for the lead midway through the final with her progressive approach. However, for Ensor, the win had been a while coming and she had been taking inspiration from Billy Stairmand in the build up to the event to help with her performances. “These events are good practice for the World Qualifying Series events and especially this one because it always has the hardest field of surfers, getting to surf against the likes of Ella is awesome because she isn’t always competing in New Zealand” added Ensor. 17-year-old Vette had to settle for runner up for the second time this year after she surfed to the same result at the National Championships held in Taranaki during January. After spending much of summer competing in Australia, it was a welcome return to the domestic scene and a good performance for the young surfer on her backhand. Vette held off four time defending champion Ella Williams (WGM) who finished third in the final ahead of Jessica Santorik (Rag) in fourth. The Rip Curl GromSearch Finals were claimed by replacement surfer Jack Lee (Whaka) and local surfer Brie Bennett. Lee dominated the boys final through to the dying stages when Whangarei’s Tom Robinson came back with a late wave that fell just short of the required score. Bennett, in contrast secured her win on her last wave, a 5.3 point ride which was enough for her to leap frog Estella Hungerford (Chch) for the win. The Rip Curl Pro is the first of four straight legs of the New Zealand Surf Series with rankings set to change considerably over the next month after the series frequents Dunedin, Christchurch and then returns to Raglan. See below for the remaining four events. Please see below for final results from the Rip Curl Pro presented by Corona completed at Manu Bay, Raglan today, Sunday 14th April 2019. Complete event write-ups, results, surfer ratings and images from the event can be viewed at Surfing New Zealand. Web clips and newsfeeds will be distributed free of charge from the event. Please contact Ben Kennings for further details. High-resolution images will be available to media upon request. Images will be distributed free of charge. Generous support from Rip Curl, Corona, Point Boardriders and Surfing New Zealand has made this event possible. New Zealand’s top surfing talent produced some outstanding performances on day one of the Rip Curl Pro presented by Corona which commenced today (Saturday 13th April) at Manu Bay Raglan. A clean 1.5m swell wrapped around the famous point breaks of Raglan with perfect offshore south east winds for much of the day. New Zealand representative Raiha Ensor (Mnt) dominated the Open Women’s Division as she advanced through to the final twelve females in the event. The 2018 National Champion surfed to a 15.2 point heat total in her first round heat to advance alongside South Island junior Estella Hungerford (Chch). Ensor is lining up a big final day of surfing at the event as she looks to dethrone four time defending champion Ella Williams (WGM). Williams also advanced through her match up today with an impressive 14.33 point heat total that was enough to edge her past an excellent performance from local surfer Jessica Santorik who scored 14.17 points. Others to win their heats included young 17-year-old Kai Woolf (Rag), Piha’s Claudia Fraser and Saffi Vette (Gis). Late in the afternoon, defending Men’s Champion Billy Stairmand (Rag) reminded the field that they were surfing on his doorstep with the top performance of the day as he went on to post 18.67 out of a possible 20 points. Stairmand’s backhand surfing is second to none at the Raglan point breaks and his performance on day one proved exactly that. Another Raglan local in Taylor Hutchison pushed his claim for a finals berth with a 16.27 point heat total to advance to the quarterfinals. The number one seed finds himself in a big battle early on day two of the event when he faces off against Gisborne legend Maz Quinn, Piha’s Dune Kennings and 15-year-old future star Jayden Willoughby (Rag). Great Barrier Island surfer Sid West was another standout as the sun went down across the West Coast tonight as he surfed to a 16.37 point heat total to advance alongside Taranaki surfer Daniel Farr. One of the few goofy foot surfers to excel on day one was Caleb Cutmore (Rag). He was the only goofy to advance to the quarterfinals from the five round two heats heats contested in the afternoon. There are only four other goofy surfers remaining in the second round with a chance of joining Cutmore including 2018 runner up Luke Cederman (Rag), Jarred Hancox (Tara), Caleb Cutmore (Mnt) and Tom Norton (Whngrei). The second round of the Open Men’s Division will resume at 7:50am on Sunday morning to determine the quarterfinalists before the Open Women’s Quarterfinals will commence. The Rip Curl GromSearch finals will take place this weekend as well where four young males and females vie for a chance to represent New Zealand at the international final. Local grom Kora Cooper will lead the way in the Boys Division and he will be up against Myka Black (Chch), Tom Robinson (Whgnrei) and Jack Lee (Whaka). In the Girls Division, it is another local surfer in Brie Bennett that faces off against Estella Hungerford (Chch), Georgia Wederell (Mnt) and Hannah King (Gis). The Rip Curl Pro is the first of four straight legs of the National Series with rankings set to change considerably over the next month after the series frequents Dunedin, Christchurch and then returns to Raglan. See below for the remaining four events of the series. The Rip Curl Pro will be broadcast live via Sky Sport 2 on Sunday from 10:30am – 3:00pm. A replay of the broadcast will be shown on the same channel from 9pm Sunday night. Please see below for results from day one of the Rip Curl Pro presented by Corona held at Manu Bay, Raglan today, Saturday 13th April 2019. The previous postponement of the Rip Curl Pro presented by Corona has fallen comfortably into the laps of defending champions Billy Stairmand (Rag) and Ella Williams (WGM) who are now available to contest New Zealand’s richest surfing event this weekend. The Rip Curl Pro presented by Corona takes place at Raglan’s Manu Bay on Saturday and climaxes on Sunday with the finals. Previous event dates had Stairmand and Williams weighing up returning from Australia where they were competing on the World Qualifying Series. Now the two will enjoy the chance to defend their titles, Williams for a sixth straight time and Stairmand gunning for his third straight. The surf conditions are expected to be good on Saturday with a clean 1.5m swell which will fade into Sunday for the finals. Aside from the defending champions in attendance, the Rip Curl Pro presented by Corona has attracted the largest field of surfers this year with a near-capacity line up. After winning the second event of the New Zealand Surf Series, The Barrett Homes Surf Open, Maz Quinn (Gis) has made the decision to give this weekend’s event a shot, the pumping Raglan waves always an attraction for previous event champion not to mention the $15,000 in prize money up for grabs. Quinn is joined by ratings leader and local standout Taylor Hutchison who will be eager to keep his position at the top of the rankings. With a pair of semifinals finishes this year, Hutchison will have his sights firmly on a finals berth come Sunday. Other surfers in the Open Division looking for a big result will be runner up at the most recent event, Levi Stewart (Waihi Bch), Luke Cederman (Rag) who has placed first and second and the two most recent events held at Raglan and Daniel Farr (Tara), a finalist in 2018 who has been making a slow return from injury this summer. In the Women’s Division, Raglan import and National Champion Aimee Brown will be keen to back up her performance in Taranaki. Brown has finalled at both events contested this year and currently leads the rankings. Saffi Vette (Gis) makes a return to the domestic scene after spending much of summer competing in Australia. Vette leads the charge for a young field of surfers where the average age is only 20 years old. Despite the young nature of the draw, all of the up and comers will have to be wary of the like of talented local mother Jessica Santorik and Whangamata’s Grace Spiers, both two-time previous event champions. The Saturday night Corona after party will take place at Isobar in Raglan township. Please see below for current ratings on the New Zealand Surf Series plus the previous winners of the event. Two 14-year-old surfers in Finn Vette (Gis) and Ava Henderson (Chch) ripped through their older counterparts to claim titles in their respective Under 18 Divisions at the Kaikoura Grom Comp held over the weekend. The two surfers were double finalists, also contesting the Under 16 Divisions, where Henderson claimed another win and Vette placed third capping off a highly successful weekend for the two surfers. The Kaikoura Grom Comp was the sixth event of the New Zealand Grom Series and doubled as the final event of the South Island Grom Series which attracted a hefty field of surfers from around the country. The solid 1.5m swell endured by competitors on Saturday had decreased overnight to a clean 1.0m swell with solid set waves still pulsing in at Meatworks, but certainly a more manageable line up than day one. Vette posted a 14.4 point heat total in the final to upstage event favourite Caleb Cutmore (Rag) who had been on fire all weekend. Vette surfed a seamlessly ridden lefthander early in the heat and backed that up with a sharp two turn combination on his backhand to hold the lead for much of the final and through to the final siren. Cutmore finished runner up, just holding off Taylor O’Leary (Mur) in third with Myka Black (Chch) in fourth. Henderson posted a 10.7 point heat total in the final of the girls division to hold off her sister Estella Hungerford who finished with 10.2 points, Henderson leaving her run late to claim the win. Double finalists Natasha Gouldsbury (Tara) and Liv Haysom (Piha) finished in third and fourth respectively. Henderson, Gouldsbury and Haysom all contested a very tightly contested Under 16 Girls Division final alongside Leah Wilson (Chch). Henderson managed her second win of the day while Gouldsbury went one better than the 18’s with a runner up finish. Wilson finished third in the final with Haysom in fourth. The Under 16 Boys Division final was the most hotly contested of the day with Taranaki surfer Tom Butland getting claiming the win. Butland and Robinson capitalised on the right-handers rolling down the beach, both surfers scoring excellent rides with Butland coming out on top 15.97 to 15.71. Vette opted to surf his forehand on the lefts and took an early lead in the final with a pair of sevens before being pegged back and ultimately finishing in third place ahead of Myka Black (Chch) in fourth. North Wai Boardriders defended their title as the top club. The Under 14 Divisions went the way of the number one seeds and rankings leaders Bill Byers (Piha) and Anna Brock (Mnt). It was the second win of the season for Byers but the fourth straight for Brock who takes an unassailable lead on the rankings with one event remaining. Hawkes Bay surfer Dale Cromhout and Piha’s Leia Millar won their respective Under 12 Divisions. The final rankings of the South Island Grom Series were also confirmed after the event. Luke Rogers (Dun) and Ava Henderson won the Under 18s. Henderson was again the winner in the Under 16s along with Reuben Lyons (Kaik). Jack McKenzie (Chch) and Misha Peyroux (Dun) won the Under 14s. Sonny Lyons (Kaik) and Tessa Gabbott (Dun) won the Under 12s. The Kaikoura Grom Comp marks the halfway point of the series for most surfers with events already having been contested in Taranaki, Mount Maunganui, Whangamata, Piha and Christchurch. Events still remain for Raglan, Christchurch, Dunedin and Hawkes Bay. Please see below for finals results from the Kaikoura Grom Comp completed at Meatworks yesterday (Sunday 7th April). For further information on the 2019 Kaikoura Grom Comp please contact Mark O’Malley on 021 2075177. High resolution action images of the surfing will be available to media free of charge. The 2019 edition of the Kaikoura Grom Comp would not be possible without the support of Kaikoura Surf Groms, Jade Kiwi, the Strawberry Tree, Kaikoura Boardriders, McCrory Plumbing, Kaikoura Bakery, Hirepool and Exit Surf. Follow the action via social media on @surfingnz across Facebook, Instagram and Twitter. Use the hashtag #kaikgroms19. The lure of pumping Kaikoura waves saw the start of the Kaikoura Grom Comp kick off with a frenzy of heats all day long yesterday (Saturday 6th April) as the massive field of surfers were slowly whittled away. The solid 1.5m swell pulsed all day and with the strong offshore winds pushing the limits of many of the young competitors as they glared back to shore for directions and on to the snow-capped ranges. The solid, predominantly right-hand peaks were the perfect platform for the top seeds to cruise through their early heats and into the semifinals. Current New Zealand Grom Series leader Caleb Cutmore (Rag) managed to surf one round in the Under 18 Boys Division but is looking forward to the final day and more time in the water after his first-up win. “It has been real fun, such a good wave, super peaky and quite easy to surf so, yeah I am stoked I have been able to get a couple of waves and I am looking forward to more out here tomorrow” said Cutmore who ventured down south with his Dad who was on a work trip. “I also get to catch up with my older brother down here and hang out so that has been good” he added. Cutmore will be joined in the semifinals by Myka Black (Chch), Taylor O’Leary (Mur) and Tom Butland (Tara) who all won their heats. The Under 16 Boys Division kicked off the day and Butland was again in action, the ratings looking sharp through his three heats contested as did Tom Robinson (Whngrei) and Finn Vette (Gis). All three surfers made easy work of their heats and advanced to the semifinals along with Myka Black who again advanced. Christchurch surfer Ava Henderson dominated the girls divisions with 14.3 point heat total in the Under 18 Girls Division helping her win her heat as well as having a solid outing in the Under 16 Girls Division. Natasha Gouldsbury (Tara) showed some exceptional form with her own 13.67 point heat total. The two surfers are poised to meet each other in the final of the division. Mount Maunganui surfer Anna Brock will look to meet Henderson and Gouldsbury in the final of the Under 16 Girls Division but her focus will also be on the Under 14 Girls Division where she showed some phenomenal grit to take on the big waves advancing through to the final where she will be joined by Leia Millar (Piha), Amiele Wink (Chch) and Misha Peyroux (Dun). Piha’s Bill Byers led the way in the Under 14 Boys Division, the solid waves no trouble for the young surfer from Auckland’s West Coast. Byers advanced to the semifinals alongside Campbell Heasley (Chch), Nixon Reardon (Dun), Thomas Boothroyd (Nel), Jake Owen (Dun) and Jack McKenzie (Chch). The Under 12 Boys and Girls Divisions were contested further up the beach with the young surfers trying to hide from large swell. Winner of the last event of the series Chloe Groube (Pau) looked strong advancing through to the final as did Leia Millar (Piha). In the Under 12 Boys Division, South Island Grom Series front runner and local surfer Sonny Lyons won his match up as did PJ Klein – Ovink (Auck), Ryder Townsend (Chch) and Hawkes Bay’s Dale Cromhout who surfed to the highest heat score of the round – 12.47 out of 20. The night surfing, bonfire and fireworks were cancelled due to the inclement weather and strong winds. Action kicks off at 8am on Sunday with twenty heats remaining to complete the event. Prize giving will be held at the Strawberry Tree in Kaikoura on Sunday afternoon at the conclusion of the surfing. Kaikoura will play host to a sea of top young surfers from around the country for the first time this weekend after the world-famous tourist and surf destination was added to the National Grom Series. The Kaikoura Grom Comp has received well over 100 entries with the surfing action expected to take place over two days at Meatworks north of Kaikoura. On Saturday night, surfers will be treated with the chance to go night surfing under floodlights which will be a new experience for many. The event marks the halfway point of the series for most surfers with events already having been contested in Taranaki, Mount Maunganui, Whangamata, Piha and Christchurch. Events still remain for Raglan, Christchurch, Dunedin and Hawkes Bay. The new location has attracted the number one ranked surfer from each of the six divisions contested in the series as well as a bunch of keen young groms who will surf in the Under 12 Boys and Girls Divisions. The wave-rich Kaikoura coastline will see the likes of Caleb Cutmore (Rag) and Georgia Wederell (Mnt) line up in the Under 18 Boys and Girls Divisions. The two surfers lead the rankings and wins this weekend would give both surfers a huge advantage heading into the back half of the series. Cutmore missed the most recent event in Christchurch but Wederell capitalised on her appearance in the South Island where she secured a runner up finish. In the under 16 divisions, it is Tom Butland (Tara) and Ava Henderson (Chch) that lead the fiercely competitive rankings. Butland is coming back from injury which has hampered his performance in recent months while Henderson has a strong rankings lead as she looks for her fourth straight win. Bill Byers (Piha) and Anna Brock (Mnt) round out the front runners in the under 14 divisions, Brock most recently winning the Christchurch event. Tao Mouldy (Mnt) and Chloe Groube (Pau) won the under 12 divisions at the Ray White Duke Festival of Surfing held in Christchurch three weeks ago and will be returning to the event this weekend looking for more glory. The recently established Kaikoura Surf Groms will have a swath of local surfers taking part in their home waters. They will be led by the Lyons brothers – Reuben, Blaise and Sonny as well as Tyler Perry. Perry was recently named as one of six Kiwi scholarship winners thanks to Global Surf Industries, with recipients receiving equipment and financial support for their surfing exploits. The Kaikoura Grom Comp doubles as an Exit Surf South Island Grom Series event with ranking points up for grabs across the regional series. It is the fifth and final event of the series. The boys divisions all remain up for grabs this weekend apart from the Under 16 Boys Division which Reuben Lyons has a stranglehold on. Ava Henderson has a tight grip on the Under 18 and 16 Divisions for the girls but the Under 14 and 12 Divisions are still closely contested. Please see below for current National Grom Series rankings after five of ten events. Full rankings can be viewed here – Under 18 Boys, Under 18 Girls, Under 16 Boys, Under 16 Girls, Under 14 Boys, Under 14 Girls. SURFING New Zealand re-elected President Chris Fougere has lauded a “new era” for the organisation at its annual general meeting held in Mount Maunganui on the 9th March. He told a large gathering at the Adams High-Performance Centre in the Mount that Surfing NZ had already taken major steps in the past nine months and was heartened by the support of clubs and members for the direction the organisation was taking. Establishing an organisation with strong governance and processes. This had included the co-opting of Mark Pevats and Trevor McKewen to the Board to add specialist “horsepower” and the employment for three days a week of Nick Cowan in the new role of General Manager of High Performance and Funding. A renewed emphasis on shortboard competition surfing and creation of high-performance pathways for those who aspire and are good enough to represent New Zealand at the Olympic level. This had resulted in the first HP workshop programme undertaken by SNZ in two decades and was also “extremely timely” given surfing’s Olympic status. Improving relationships with our elite competition surfers. Fougere said feedback from the likes of Paige Hareb and Ricardo Christie around recent SNZ initiatives had been “phenomenal”. Beginning work on a new Strategic Plan to replace the current one and which is to include the Environment as “one of three key pillars” with the others being Participation and High Performance. Fougere said that while Surfing NZ’s current financial position was under pressure, there was a plan to ensure the organisation moved ahead on a solid footing. The AGM saw President Chris Fougere and Vice President Matt Sale re-elected unopposed. The meeting included elections for the North Island Club Representative and the Independent Board Member Position which had been vacated by Waihi’s Alexis Poulter. Andrew Vette was appointed for two years to the role of North Island Representative. Legendary Kiwi women’s surfer Pauline Pullman won the vote for the position of Independent Board Member. A multi-national title-winner and NZ’s first pro women’s surfer, Pullman was humbled to be elected and promised her “full commitment” to the organisation. Fougere and other long-time surfing participants described the AGM as “one of the most positive in years”. The President thanked the clubs for the spirit of co-operation he was seeing and urged them to increase their capability with the assistance of SNZ so surfing could recognise its “unique and exciting opportunities”. “Surfing is on a major roll,” he said. Download the 2018 AGM Minutes or head here for more information about the AGM. 19-20, South Island Grom Series Event 2, Dunedin – Under 18, 16, 14, 12 boys and girls. ENTER HERE. Entries close 11:59 Wednesday 16 January. Surf Kiwi promoting the lifestyle and growing surfing in New Zealand at all levels. Surf Kiwi is a collaboration by Kiwi surfers, non for profit keeping the stoke high!